At last, mega-bestselling author Sister Souljah delivers the stunning sequel to The Coldest Winter Ever that fans have been eagerly waiting for. Frighteningly fierce, raw, and completely unpredictable, this coming-of-age adventure is woven with emotional intensity. 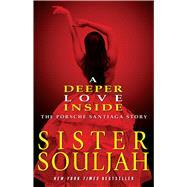 A Deeper Love Inside is written in the words of Porsche Santiaga, Winter’s sharp-tongued, quick-witted younger sister. Porsche worships Winter. A natural born hustler, Porsche is also cut from the same cloth as her father, the infamous Ricky Santiaga. Passionate and loyal to the extreme, Porsche refuses to accept her new life in group homes, foster care, and juvenile detention after her wealthy family is torn apart. Porsche— unique, young, and beautiful—cries as much as she fights and uses whatever she has to reclaim her status. Unselfishly, she pushes to get back everything that ever belonged to her loving family. In A Deeper Love Inside, readers will encounter their favorite characters from The Coldest Winter Ever, including Winter and Midnight. Sister Souljah’s soulful writing will again move your heart and open your eyes to a shocking reality.